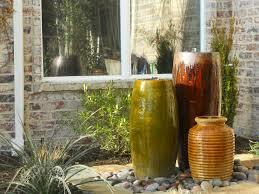 Decorative pots can help transform your home or business into a beautiful work of art. Blooms Landcare in Fort Worth, TX helps our clients choose the perfect decorative pots for your residential or commercial property. When it comes to landscape design and landscape maintenance, decorative pots often play a quiet role, but a critical one. Let Blooms Landcare show you how big of an impact small details can have on the overall look of your landscape. Decorative pots come in a variety of shapes, sizes, colors, and textures. Your property can feature everything from wall pots to balcony pots. They can come in all styles, including clay, all forms of metal, plastic, ceramic, or even a stunning marble. Decorative pots can provide a pop of color and texture to any well-landscaped property. They are an inexpensive and creative way to add considerable value to your home or business. Blooms Landcare has a team of degreed landscaping professionals who have the knowledge and expertise to take your property to the next level. We custom-tailor each design plan to the customer’s needs and offer a wide variety of services to create your perfect landscape. We offer all our services at affordable rates and with exceptional customer service. Decorative pots placed around the yard outdoors are often used to completely transform the overall appearance of your home or commercial property into a work of art with bright colors and wonderful smells all around. Regarding landscape design, it sometimes pays to have numerous decorative ceramic parts to contrast the green colors of bushes, trees, and grass. You can use these ceramic pots to host any number of different flowers or plants – from the most colorful to the most useful in the kitchen. No one says you need to have a little garden in the backyard to grow something green and useful for cooking on the weekend. Decorative pots often come in a wide variety of different shapes and colors, allowing the homeowner or business owner to select a style that suits their needs and overall sense of style. You can mix and match or simply get an entire set to work together. Starting a beautiful and versatile garden can be a difficult task. Many people take up gardening as a way to relax after a long workweek, while some use flowers to enhance the look and value of their home. Of course, your garden is only as good as what you grow and its overall design. With our line of flower pots, your garden will take a step above the entire neighborhood. You can arrange by color and size, or purchase a wide variety of decorative flower pots to achieve an aesthetic you find pleasing. At Blooms Landcare, we have a wide selection of pots available to help transform the lawn of your home or business into something truly astounding. Our customer service representatives can help you select the decorative pots for any occasion. When it comes to planning out your garden to ensure you use all of the space efficiently, containers can play a significant role. Creating a container garden is a brilliant way to bring your vegetables and herbs into the kitchen for cooking, especially if you are short on space in the house or the yard. Containers work perfectly for those who do not have a lot of time to tend to the soil, offer nutrients to the flowers, and water every single day. Those who are new to gardening tend to tackle container pots with ease. Many people looking for a slight expansion to their existing garden area without taking up too much room will find that various sized containers work wonders. You can choose to group the containers together to form their garden or spread them out for a more dispersed appearance. Either way, a thriving garden is yours for the taking. When most people think of gardening, they probably don’t consider concrete pots as an option. Those people, however, have never witnessed the wonders that can be created in a spread of green grass. While it is more common to see concrete pots lining the sidewalk of the town or along commercial property, these containers can be placed anywhere for just the right look. Most concrete pots are quite large, too, which means large bushes, small trees, and a bevy of flowers can be planted with ease. Whatever your heart’s desire, we have a concrete pot for you. With a little help from the customer service representatives at Blooms Landcare, you will find the most attractive concrete pots to beautify your landscape. While providing fresh vegetables, garden herbs, and gorgeous flowers, concrete pots are also easy on the eyes and meld into the scenery quite well. What size of pots is best for indoor plants? When selecting the right pot size for your indoor plants, you should know that there are four main sizes often used for indoor flowers and plants: 6 cm, 8 cm, 13 cm, and 18 cm. Large trees or floor-standing plants, however, may require you to go as large as 25 cm to successfully accommodate them. When it comes to protecting your flooring from pots of any size in the home, there are saucers available designed specifically to accommodate various sizes. These saucers are put between the pot and the floor, and you can usually receive them for free from a gardening store when purchasing a pot – especially a large pot. Choosing the right pot for your home solely depends on the types of plants you intend to introduce to the interior of your home. The bigger the plant, the bigger the pot. Easy! For more information about our decorative pot services, contact Blooms Landcare. Dial (817) 688-5352 to schedule an appointment with one of our landscaping experts today.